Why choose to attend William & Mary? I’ll offer up two reasons to attend William & Mary: people & places. It’s the people that make William & Mary a distinctive and supportive community. 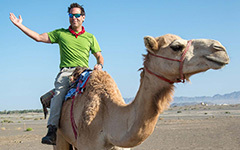 At W&M you’ll be afforded the opportunity to learn, study and conduct research, not just on our winsome campus, but at places across the globe. 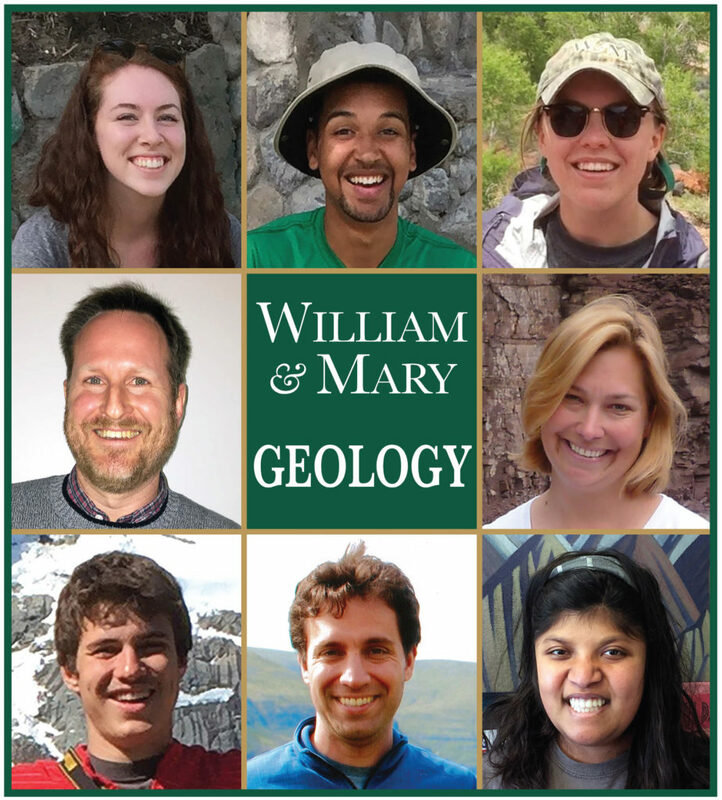 The W&M Geology Department provides a prime example of just why William & Mary is special. Problem solving in a W&M Geology class. What fun! Click on the image to have a closer look. 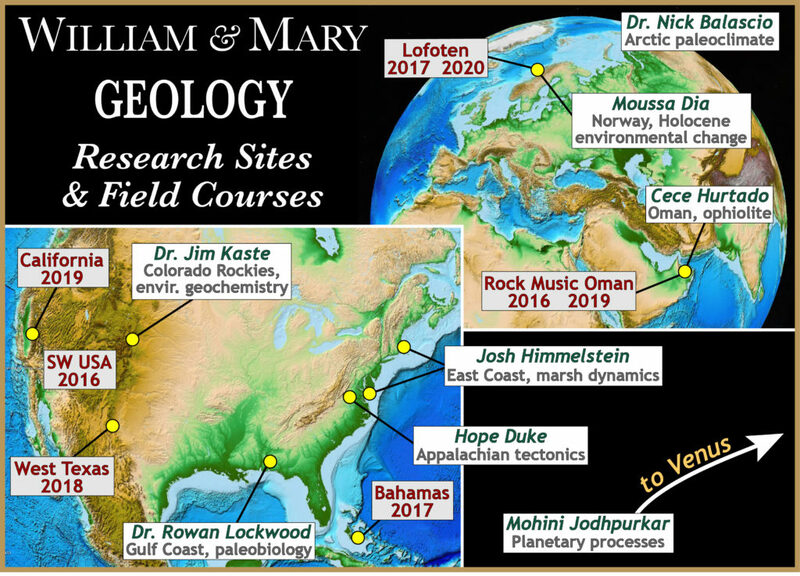 At William & Mary, the Geology department takes a broad view on the Earth, offering courses that focus on the workings of the Earth and its environments from the deep interior to the atmosphere and outwards to distant planets. We’re a dynamic intellectual community and that’s evident from our introductory to upper-level courses. 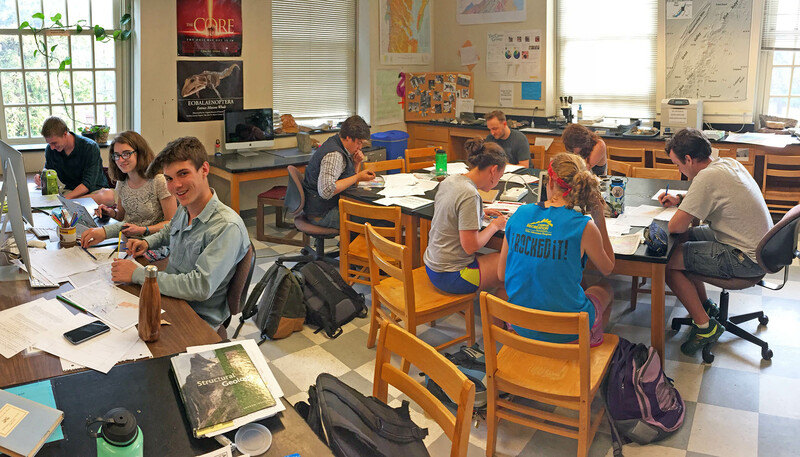 The Geology faculty are award-winning teacher/scholars that make the classroom an energized and engaging place to be. William & Mary geology students are an impressive and welcoming group. Our graduating classes range from 25 to 40 students per year (which is quite a pile of geologists; and few universities match the number of geology graduates that W&M turns out). You’ll know your fellow students, and the Geology faculty will be invested in your academic success. It’s refreshing to be part of a cohesive (and a tad geeky) academic cohort. Just another afternoon in the Geology department’s Chamber of Delights. Geology students working collaboratively on research and course work. To learn about the Earth, it’s best to go see the Earth in action. 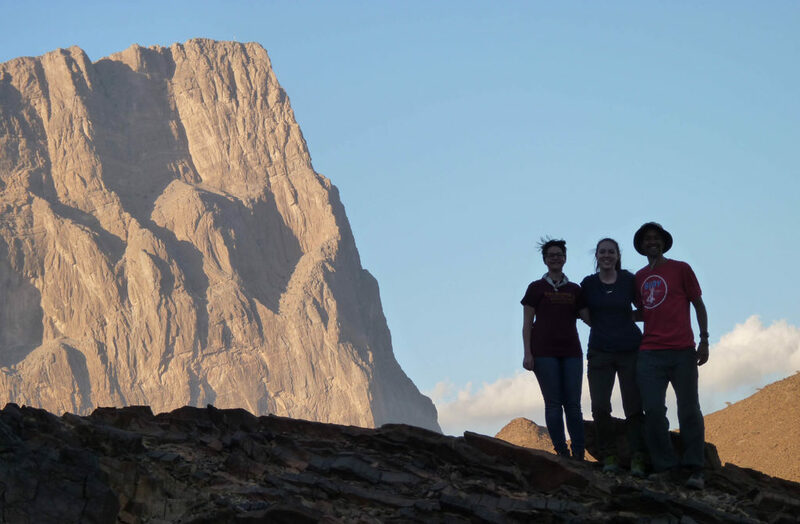 The Geology department takes William & Mary students to remarkable places to study geology. Every semester our departmental field trip is open to all comers, and we take a weekend to explore the landscape and environment of the mid-Atlantic region. Our class field trips can be epic experiences where you’ll do science with your peers. Our Regional Field Geology courses will take you from the United States’ southwestern deserts to coral reefs in the Bahamas to Arctic islands in Norway. 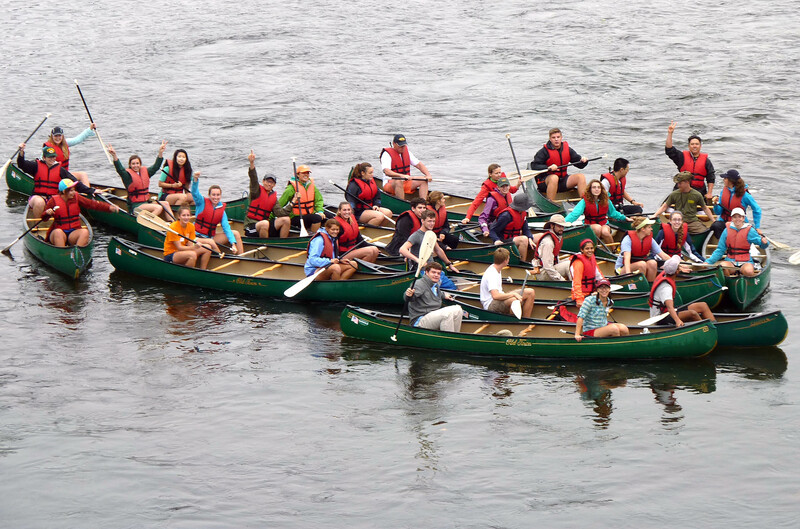 W&M geologists afloat on Virginia’s James River during a departmental field trip. 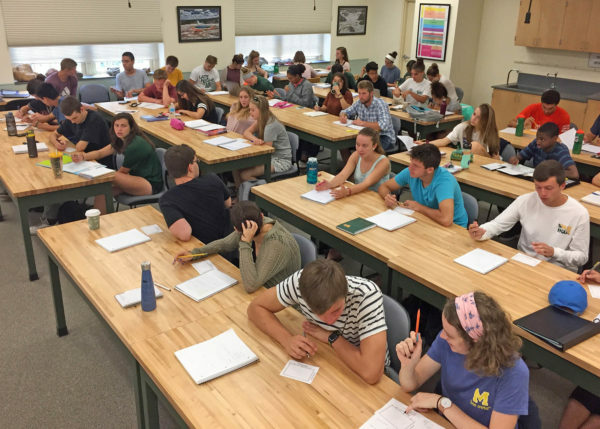 The Geology department’s ‘go-study-the-world’ attitude is reflected across William & Mary, as more W&M undergraduates study-away than at any other public university in America. W&M Geology faces! A sampling of William & Mary Geology people. Clockwise from the upper left corner – Cece Hurtado ’17, Moussa Dia ’18, Hope Duke ’19, Professor Rowan Lockwood, Mohini Jodhpurkar ’19, Professor Nick Balascio, Josh Himmelstein ’18, and Professor Jim Kaste. The sample of happy faces above provides perspective on W&M Geology people; the list below provides details on the breadth of their research and the places they study. Cece Hurtado’s research is focused on understanding the Oman ophiolite, a chunk of the Earth’s mantle and ocean floor that ended up in Arabia. Moussa Dia’s research took him to Norway where he cored lakes to better understand environmental changes during the Viking Age. Hope Duke’s working on two research projects – one with Holocene mollusks from the Atlantic Ocean continental shelf and another focused on determining when the Appalachian mountains collapsed. Professor Rowan Lockwood’s research interests stretch from the realm of paleontology into conservation biology. Her research students study everything from scallops to dinosaurs, and do that research from museum archives to the field. Mohini Jodhpurkar’s research is out of this world, literally! She’s studying the geology of both Mars and Venus, and just presented some of her results at the Lunar and Planetary Science Conference in Houston. Professor Nick Balascio studies paleoclimate and environmental change over time. His research takes him (and his students) from the Arctic to Rapa Nui (Easter Island) in the Pacific. Josh Himmelstein is interested in coastal environments and his research with faculty at the Virginia Institute of Marine Science includes study sites in New England and on Virginia’s Eastern Shore. Professor Jim Kaste is an environmental geochemist who studies the interaction between atmosphere processes and Earth’s surface. His research sites range from the College Woods to the Colorado Rockies and beyond. A few William & Mary research sites and recent field course locations 2016 – 2020. 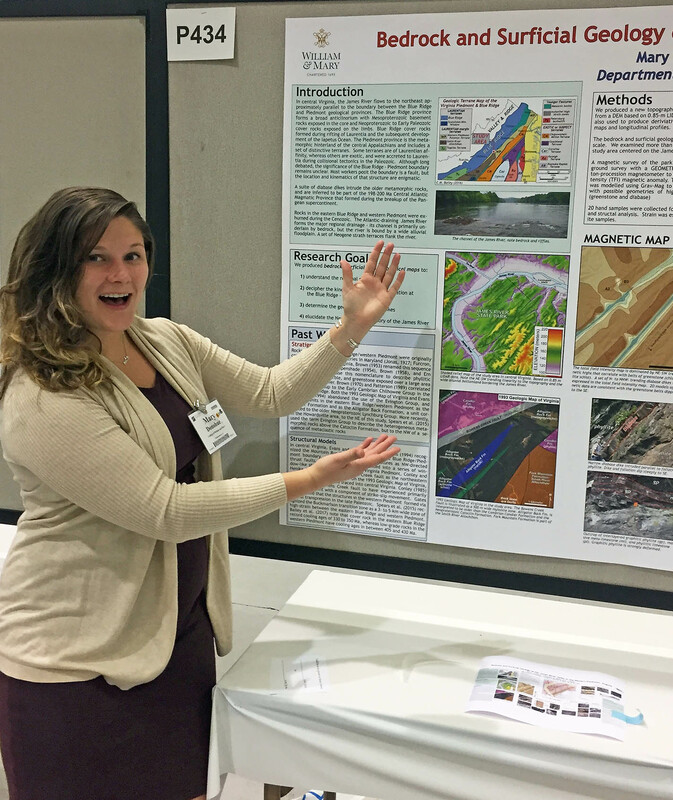 Mary Donohue (W&M Geology class of 2017) presents her research at the Geological Society of America annual meeting in Seattle, WA. Independent senior research is a hallmark of the William & Mary Geology program; it’s part of what makes us one of the strongest undergraduate departments in America. Most of you won’t come to William & Mary planning to major in Geology, but as you are one of the ~7.5 billion people on Planet Earth it makes good sense to learn more about the planet upon which you reside! Come to William & Mary, take a W&M Geology course, and go out on a field trip or field course. The people make it special, and the places we study are spectacular. William & Mary undergraduate geology research students amongst the shadows below Jebel Misht, Oman. Categories: Academics, Faculty & Staff Blogs, Global Engagement, Research, Study Away Tags: Community, geology, study away, undergraduate research, Why W&M? I’m glad William and Mary “encourages” (i.e. requires) you to take courses you might not otherwise take. I stumbled into geology because of an awesome intro course taught by a difficult but charismatic professor (ahem). I learned things that I thought I knew (wrong!) or was embarrassed that I didn’t know. I couldn’t believe how motivated I was to perform well when I was learning things that applied to my everyday life.